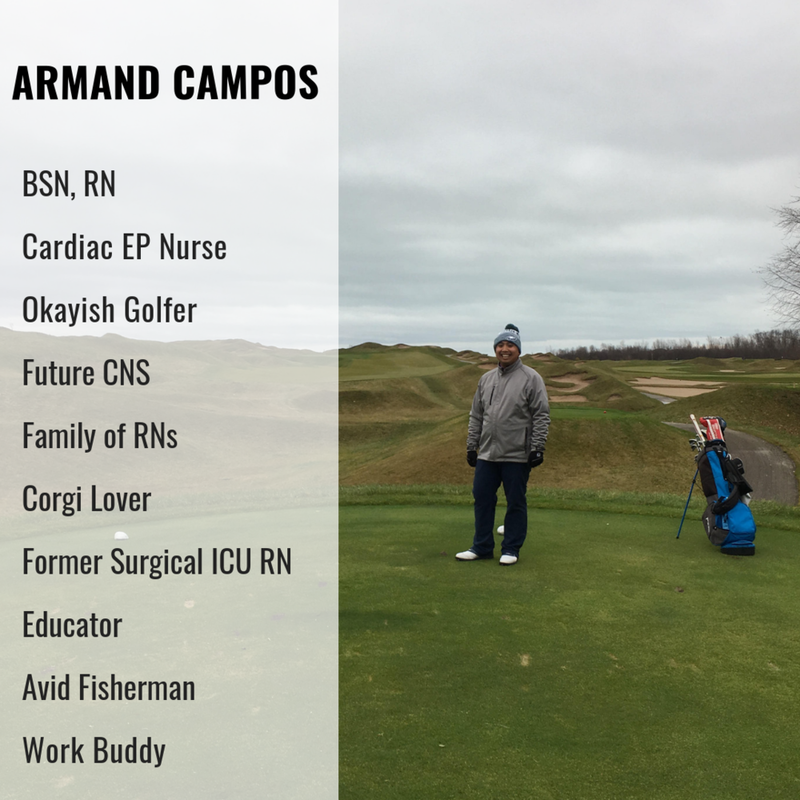 I’m excited to introduce Nurse Armand to you! Armand, like most of us out there, has experienced burnout. He was kind enough to share his story below along with his methods of beating burnout (preferably with a golf club) and how he became a more resilient nurse! 1. Please tell me about yourself and your nursing career up to this point. Where do you see yourself going in the future? I come from a family of nurses. My mother practiced for 41 years before recently retiring, and my only sister worked as an outpatient hospice nurse, and is now an adult-gerontology nurse practitioner. In addition, 14 other family members are nurses, and the cool thing is that none of us overlap in our specialties. Needless to say, I didn’t really have any other option! I received by Bachelors of Science in Nursing from La Salle University, in Philadelphia, PA. During my schooling, I worked as a Nurse Extern in a Surgical/Trauma ICU. After I passed my boards, my first job was in a Surgical ICU where I worked with a broad variety of surgical patients; everything from neurosurgery, head and neck, complex general surgery, orthopedics, thoracic and more! After a couple years there I started feeling burnt out, and decided to take my skillset to a procedural area. I now work in a Cardiac Electrophysiology lab, where I take care of patients with cardiac dysrhythmias undergoing procedures such as pacemaker/ICD implants and cardiac ablations. I have a big interest in nursing education, and have taught lab and clinical components in a bachelors program. Also, I have done coursework towards my Masters as a Clinical Nurse Specialist. I see myself going into nursing education on a more than part-time basis, but I still want to take care of patients and stay clinically competent. 2. Merriam-Webster Dictionary describes burnout as "exhaustion of physical or emotional strength or motivation usually a result of prolonged stress or frustration." Have you ever felt burned out? How did it develop and how did you handle (or not handle) it? I did feel burnt out which lead me to leave my first job. I didn’t feel supported by my coworkers, and felt as if I was walking on eggshells at times. I hated going to work, didn’t feel like I was making a difference, and felt like I wasn’t doing my best to take care of my patients. It was a real tough time. I tried to cope and just tell myself it would get better as time went on, but at a certain point I decided I needed a change for my own sanity and looked for a different job. So I left that job and haven’t looked back since. It was a refreshing moment. I feel supported in my new job and could make a difference to patients and their families. I was afforded new leadership and educational opportunities that I wouldn’t have had in my previous job, and that has definitely helped me recover my spark. 3. What do you do on your days off to push through it and get ready to bounce back for the next shift? Oddly enough, during my “dark ages” I picked up a new hobby, playing golf. It was the perfect thing to do on those random Tuesdays off during the middle of the day when all my other friend were busy. That’s been my saving grace especially after rough shifts. It was nice to walk in the lush fairways and take in nature while challenging myself in a new endeavor. It became a nice blend of stress relief by hitting something with a stick, and taking my mind off things and enjoying nature. Just like anything, early recognition and support would be a great benefit to new nurses. Realizing that it’s more and more common with new nurses, acting fast to find new efforts to keep their spark, even if it means finding a new place to work. A lot of times nurses (especially new graduates) don’t want to upset their coworkers or managers by leaving but sometimes a change of scenery into something you really have an interest in is what you need. Also nurses should realize that although our lives revolve around nursing, we need to be mindful that we are more than just workers. We all need to realize that it’s important need to take time for yourself. Use your vacation time! Find the value turning off your nurse mode, even just for a little bit, (or 18 holes haha). Burning the candle at both ends doesn’t help anybody. Armand and I first met in 2017 at AACN’s NTI in Houston, TX! 5. How long did it take you to feel "comfortable" in each new role you've taken on? Any advice to nurses who are experiencing the stress of starting something new? When I was a new graduate, it was very difficult transitioning from being ancillary staff to being a nurse. There was just so much responsibility and new roles to adapt to. It took me a year or so to feel totally comfortable in my role. When I took my new job, it was a quicker adaption, but took a few months to get the flow of things. It is definitely stressful being in a new environment with different people and a new role, but my biggest advice is finding someone to be your buddy to struggle with. They can become your rock when things get tough. There were no better shifts than when I was paired up with my work wife when we could pull together. I’m still friends with her, even though we’re 700 miles away! Learning new things and utilizing my skills as an educator to spread knowledge to students and new nurses. I can only take care of so many people in my career, but I can affect all the patients cared for by my students too! THANKS to Armand for being willing to do this interview with me! I love his strategies for fighting burnout, especially finding a hobby and a friend at work! Those are two of my tried and true methods as well. You can find Armand over on Instagram @mursearmand!